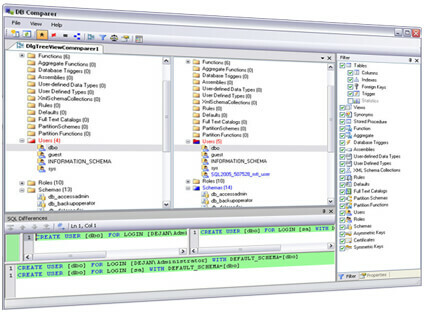 DBComparer is a professional database comparison tool for analyzing the differences in Microsoft SQL Server 2008 (and 2005) database structures. It is an excellent tool for any project development team or DBA managing multiple copies of the same database on an SQL Server. This database comparison tool has a clean and straight-forward user interface. Results are clearly presented so that you can immediately see the differences in your databases. It will make locating and eliminating differences in your database fast and easy. In a Development or Test environment, you tend to have frequent changes to your databases and database schemas. But on live (Production) databases with real and potentially sensitive data, changes to the database schema are rare and can be complicated. In order to avoid unsuccessful deployments of your database related projects, you have to be sure that your databases are synchronized; DBComparer can offer you the peace of mind knowing that you caught all the differences between your environments and that changes are successfully migrated to Production. As soon as you download DBComparer you can start analyzing your databases. A quick run of the program will show you the differences you are looking for by comparing your databases. Please refer to the database compare walk thru section for more information. 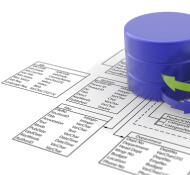 Why do you need a database comparison tool? When you are implementing a database solution, you need to be sure that you are running the same database schema in your development and live environments. If you were to start analyzing both databases manually in order to be sure that there are no differences, you would spend hours of your time with no guarantee when you were done, that you had found all of the differences. In this case, you need a database comparison tool. It will find the differences for you in your databases, allowing you to make changes as you see fit. It also offers you peace of mind knowing that your results will be 100% accurate. DBComparer offers an intuitive and easy to use interface that will locate differences on both databases in minutes. Save yourself time and prevent problems resulting from manual comparisons - download and try DB Comparer today!